Have a Paasche D500 air compressor about 2 1/2 years old that just began starting and stopping repeatedly and not maintaining pressure. 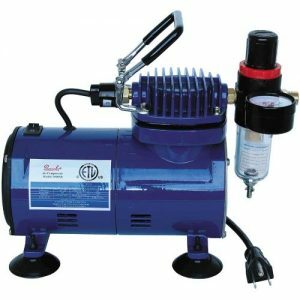 A Paasche D500 SR 1/8 HP air compressor. Usually means a leak somewhere. Try running through the troubleshooting guides for some things to look for. Thanks for the info Doug, however; have gone through all that you have provided. The start and stop is occurring about every 3 to 5 seconds. Have been unable to find any trouble shooting info on the net, hopefully someone see this and have had same problem and knows the solution. Have sent email to Paasche but have not received a response as of this date. Is the D500SR pictured representative of your unit? OK, no f/r, but do you have the thing on the other side of the head with the wire going into the case (this is NOT the power cord)? Do have a guage similar to the one on f/r, or any gauge you can hook up to it? If so, please give the pressure readings of the hi/lo during the cycling. Do not have a pressure gauge. Maybe this will help. Within 1 to 2 seconds after turning on it stops, within maybe 1 to 2 seconds starts again, runs 1 to 2 seconds and stops again. This pattern is continuous and the air pressure never gets to a usable level. This now sounds like maybe your intake reed or diaphragm is at least weak, probably broken. Or maybe, if you’re lucky, the head is just loose. So, see if the screws in the head are reasonably tight, and if not try tightening and retest. Failing that, you need to remove the head to see what’s going on there. Thanks again, have already checked for loose nuts, bolts screws and everything is secure. Do you have any ideas as to what to look for on the inside, and or how to obtain an exploded parts view. Have looked for info on the net but seems Paasche might want to keep this to themselves? Try this – just two pages, but fairly good drawing. It is strange how crummy their own website is. Thanks, found the same thing late last night. Will try this weekend to open up and see what can be found. New comment? New question? Please add it here along with photos to help others help you with your compressor and equipment problem! New comments and postings are shown below, oldest first. What Colin said ? ? ? Hi Doug, thanks for the check on this page. We were all kind of waiting to hear back from Rich about what he found, but he didn’t do so. Does this whole scenario not sound either like a loose wire or a malfunctioning pressure switch to you? This were mine, I’d find a new switch and change it out. Hmm. Maybe, But it sounds like he checked the obvious loose stuff. Maybe just jump the pressure switch and plug it in to see what happens…smoke? Or if pressure gets to cut-off, unplug, then remove jumper and replace p/s if it reverts.